1. HOW DO YOU WORK VIRTUALLY IF THIS IS A VISUAL MEDIUM? DON’T YOU NEED TO BE IN PERSON? I now use Webex Conferencing Technology for my private coaching. Its a wonderful medium that allows both of us to see and hear each other (through our computers) and I also use a sketching tablet in case any visual notes are necessary for the kind of work we are doing (you can see the notes being created in front of your eyes, and digital files sent to you after each session). 2. WHAT IS THE AGENDA AND PROCESS? Agendas are customized according to your unique needs, which we determine in your Exploratory/Design call. Tele-coaching sessions are 45 minutes in length (although please leave 60 minutes in case we need some extra time). Upon receipt of payment (or beginning of payment plan) my assistant sends you a scheduling invite to pick your time for your first session. At the end of each session we consult our schedules and book time for next session. 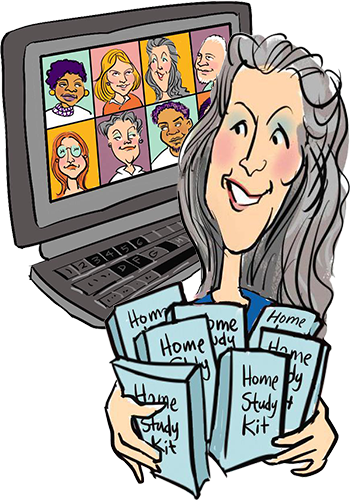 I virtually coach on certain days of the week which change according to my teaching schedule (usually my coaching days are Tuesdays and Wednesdays, with choices between 10 and 5pm pacific). Accommodations for other times can occasionally be made. My in-person coaching is usually conducted Thurdays-Saturdays. Upon purchase of coaching package, no refunds are granted (although dates can be rescheduled or sessions transferred to another person … pending my approval of the transfer (i.e. I will need an intake call with the person the time is being transferred to, to determine they are suitable candidate). I require at least 48 hours notice to reschedule a booked session. Less than 48 hours results in forfeiture of session. Should I need to reschedule a call at least 48 hours notice will be given, otherwise a complimentary call is granted. 4. I SEE OTHER PEOPLE ON THE INTERNET IDENTIFYING THEMSELVES AS SHIFT-IT OR VISUAL COACHES TOO. HOW COME? WHO IS BEST FOR ME TO WORK WITH? I am the original SHIFT-IT Coach. 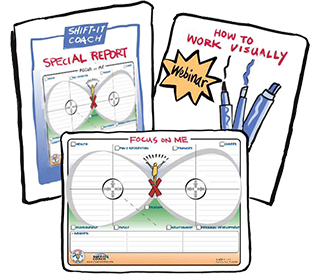 The work originated out of my background in Organizational Development & Transformation, graphic facilitation, coaching, Law of Attraction and other influences (article on my journey with Visual Coaching). Since 2010 I have been certifying other coaches, therapists, etc. in my process, tools and the overall way of working visually. I am pleased to attract wonderful process professionals from around the world to Visual Coach Certification. Through them SHIFT-IT and Visual Coaching are spreading far and wide — and doing great work in the world. Something I’m honored to be a part of. I am very particular about who is admitted into my program and there is a rigorous training and exam process to successfully graduate. Certified Visual Coaches in good standing are listed on the Visual Coach Directory. As for who is the best person to work with, I suggest you shop around. And go with the person who feels the best fit to you and your particular needs. There is lovely diversity in geography, background and approach throughout the coaches. Just because I’m the originator doesn’t mean that I’m the best coach for you. Follow your gut, it always knows! 5. DO I NEED TO DO ANYTHING SPECIFIC TO PREPARE? Depending on what we discuss during your Exploratory/Design call there may or may not be anything you need to do to prepare for the experience. We’ll sort that out during our preparatory discussion. 6. I’M IN, HOW DO WE PROCEED? Our next step, if we haven’t already, is to have an exploratory call to answer any of your remaining questions and to determine if we’d like to work together. To schedule this complimentary call simply email my assistant at admin@shift-it-coach.com and she’ll send you a scheduling invite to pick a convenient time to speak. Should we wish to proceed, simply return to the Private Coaching: Session Packs and purchase your desired session volume. I look forward to our exploratory call. ® All Rights Reserved. SHIFT-IT Coach, Inc.